MITHRAISM: FREEMASONRY AND THE ANCIENT MYSTERIES – Temple Lodge, No.33, Duncan, B.C. We came across this article on the Grand Lodge of Antient Free and Accepted Masons of Scotland Facebook page. We have reproduced it here with permission. We have added some links to some names, places and references for readers wanting to research this further. 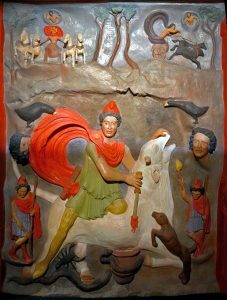 FYI here is a link to an article about the Roman Temple of Mithras discovered beneath the Bloomberg headquarters in London. The theory that modern Freemasonry is in some sense a direct descendant from the ancient Mysteries has held a peculiar attraction for Masonic writers this long time, and the end is not yet, for the world is rife with men who argue about the matter up and down endless pages of print. It is a most difficult subject to write about, so that the more one learns about it the less he is inclined to ventilate any opinions of his own. The subject covers so much ground and in such tangled jungles that almost any grand generalization is pretty sure to be either wrong or useless. Even Gould, who is usually one of the soundest and carefullest of generalizers, gets pretty badly mixed up on the subject. Way back in the beginning of things, so we may learn from the Avesta, Mithra was the young god of the sky lights that appeared just before sunrise and lingered after the sun had set. To him was attributed patronship of the virtues of truth, life- giving, and youthful strength and joy. Such qualities attracted many worshippers in whose eyes Mithra grew from more to more until finally he became a great god in his own right and almost equal to the sun god himself. “Youth will be served,” even a youthful god; and Zoroastrianism, which began by giving Mithra a very subordinate place, came at last to exalt him to the right hand of the awful Ormuzd, who had rolled up within himself all the attributes of all gods whatsoever. After the collapse of the Persian Empire, Phrygia, where so many religions were manufactured at one time or another, took Mithra up and built a cult about him. They gave him his Phrygian cap which one always sees on his statues, and they incorporated in his rites the use of the dreadful “taurobolium,” which was a baptism in the blood of a healthy young bull. In the course of time this gory ceremony became the very center and climax of the Mithraic ritual, and made a profound impression on the hordes of poor slaves and ignorant men who flocked into the mithrea, as the Mithraic houses of worship were called. Mithra was never able to make his way into Greece (the same thing could be said of Egypt, where the competition among religions was very severe) but it happened that he borrowed something from Greek art. 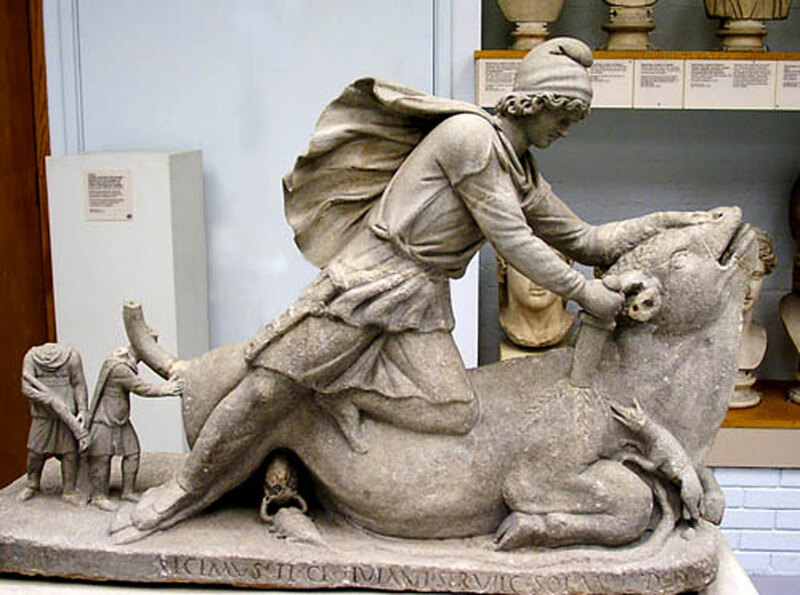 Some unknown Greek sculptor, one of the shining geniuses of his nation, made a statue of Mithra that served ever afterwards as the orthodox likeness of the god, who was depicted as a youth of overflowing vitality, his mantle thrown back, a Phrygian cap on his head, and slaying a bull. For hundreds of years this statue was to all devout Mithraists what the crucifix now is to Roman Catholics. This likeness did much to open Mithra’s path toward the west, for until this his images had been hideous in the distorted and repellant manner so characteristic of Oriental religious sculpture. The Oriental people, among whom Mithra was born, were always capable of gloomy grandeur and of religious terror, but of beauty they had scarcely a touch; it remained for the Greeks to recommend Mithra to men of good taste. When Mithridates Eupator – he who hated the Romans with a virulency like that of Hannibal, and who waged war on them three or four times – was utterly destroyed in 66 B.C. and his kingdom of Pontus was given over to the dogs, the scattered fragments of his armies took refuge among the outlaws and pirates of Cilicia and carried with them everywhere the rites and doctrines of Mithraism. Afterwards the soldiers of the Republic of Tarsus, which these outlaws organized, went pillaging and fighting all round the Mediterranean, and carried the cult with them everywhere. It was in this unpromising manner that Mithra made his entrance into the Roman world. The most ancient of all inscriptions is one made by a freedman of the Flavians at about this time. Mithra began down next to the ground but the time came when he gathered behind him the great ones of the earth. Antoninus Pius, father-in-law of Marcus Aurelius, erected a Mithraic temple at Ostia, seaport of the city of Rome. With the exception of Marcus Aurelius and possibly one or two others all the pagan emperors after Antaninus were devotees of the god, especially Julian, who was more or less addle-pated and willing to take up with anything to stave off the growing power of Christianity. The early Church Fathers nicknamed Julian “The Apostate”; the slur was not altogether just because the young man had never been a Christian under his skin. Why did all these great fellows, along with the philosophers and literary men who obediently followed suit, take up the worship of a foreign god, imported from amidst the much hated Syrians, when there were so many other gods of home manufacture so close at hand? Why did they take to a religion that had been made fashionable by slaves and cutthroats? The answer is easy to discover. Mithra was peculiarly fond of rulers and of the mighty of the earth. His priests declared that the god himself stood at the right hand of emperors both on and off the throne. It was these priests who invented the good old doctrine of the divine right of kings. The more Mithra was worshipped by the masses, the more complete was the imperial control of those masses, therefore it was good business policy for the emperors to give Mithra all the assistance they could. There came a time when every Emperor was pictured by the artists with a halo about his head; that halo had originally belonged to Mithra. It represented the outstanding splendour of the young and vigorous sun. After the Roman emperors passed away the popes and bishops of the Roman Catholic Church took up the custom; they are still in the habit of showing their saints be-haloed. Mithraism spread up and down the world with amazing rapidity. All along the coast of northern Africa and even in the recesses of the Sahara; through the Pillars of Hercules to England and up into Scotland; across the channel into Germany and the north countries; and down into the great lands along the Danube, he everywhere made his way. London was at one time a great center of his worship. The greatest number of mithrea were built in Germany. Ernest Renan once said that if ever Christianity had become smitten by a fatal malady Mithraism might very easily have become the established and official religion of the whole Western World. Men might now be saying prayers to Mithra, and have their children baptised in bull’s blood. After overthrowing its hated rival, the early Christian Church so completely destroyed everything having to do with Mithraism that there have remained behind but few fragments to bear witness to a once victorious religion. What little is accurately known will be found all duly set down and correctly interpreted in the works of the learned Dr. Franz Cumont, whose books on the subject so aroused the ire of the present Roman Catholic Hierarchy that they placed them on the Index, and warned the faithful away from his chapters of history. Today, as in Mithra’s time, superstitions and empty doctrines have a sorry time when confronted with known facts. The life of a Mithraist was understood as a long battle in which, with Mithra’s help, he did war against the principles and powers of evil. In the beginning of his life of faith he was purified by baptism, and through all his days received strength through sacraments and sacred meals. Sunday was set aside as a holy day, and the twenty-fifth of December began a season of jubilant celebration. Mithraic priests were organized in orders, and were deemed to have supernatural power to some extent or other. Masonic writers have often professed to see many points of resemblance between Mithraism and Freemasonry. Albert Pike once declared that Freemasonry is the modern heir of the Ancient Mysteries. It is a dictum with which I have never been able to agree. There are similarities between our Fraternity and the old Mystery Cults, but most of them are of a superficial character, and have to do with externals of rite or organization, and not with inward content. When Sir Samuel Dill described Mithraism as “a sacred Freemasonry” he used that name in a very loose sense. Nevertheless, the resemblances are often startling. Men only were admitted to membership in the cult. “Among the hundreds of inscriptions that have come down to us, not one mentions either a priestess, a woman initiate, or even a donatress.” In this the mithrea differed from the collegia, which latter, though they almost never admitted women as members, never hesitated to accept help or money from them. Membership in Mithraism was as democratic as it is with us, perhaps more so; slaves were freely admitted and often held positions of trust, as also did the freedmen of whom there were such multitudes in the latter centuries of the empire. Membership was usually divided into seven grades, each of which had its own appropriate symbolical ceremonies. Initiation was the crowning experience of every worshipper. He was attired symbolically, took vows, passed through many baptisms, and in the higher grades ate sacred meals with his fellows. The great event of the initiate’s experiences was the taurobolium, already described. It was deemed very efficious, and was supposed to unite the worshipper with Mithra himself. A dramatic representation of a dying and a rising again was at the head of all these ceremonies. A tablet showing in bas relief Mithra’s killing of the bull stood at the end of every mithreum. This, mithreum, as the meeting place, or lodge, was called, was usually cavern shaped, to represent the cave in which the god had his struggle. There were benches or shelves along the side, and on these side lines the members sat. Each mithreum had its own officers, its president, trustees, standing committees, treasurer, and so forth, and there were higher degrees granting special privileges to the few. Charity and Relief were universally practised and one Mithraist hailed another as “brother.” The Mithraic “lodge” was kept small, and new lodges were developed as a result of “swarming off” when membership grew too large. Manicheeism, as I have already said, sprang from the ashes of Mithraism, and St. Augustine, who did so much to give shape to the Roman Catholic church and theology was for many years an ardent Manichee, and through him many traces of the old Persian creed found their way into Christianity. Out of Manicheeism, or out of what was finally left of it, came Paulicianism, and out of Paulicianism came many strong medieval cults — the Patari, the Waldenses, the Hugenots, and countless other such developments. Through these various channels echoes of the old Mithraism persisted over Europe, and it may very well be, as has often been alleged, that there are faint traces of the ancient cult to be found here and there in our own ceremonies or symbolisms. Such theories are necessarily vague and hard to prove, and anyway the thing is not of sufficient importance to argue about. If we have three or four symbols that originated in the worship of Mithra, so much the better for Mithra! After all is said and done the Ancient Mysteries were among the finest things developed in the Roman world. They stood for equality in a savagely aristocratic and class-riddled society; they offered centers of refuge to the poor and the despised among a people little given to charity and who didn’t believe a man should love his neighbour; and in a large historical way they left behind them methods of human organization, ideals and principles and hopes which yet remain in the world for our use and profit. It a man wishes to do so, he may say that what Freemasonry is among us, the Ancient Mysteries were to the people of the Roman world, but it would be a difficult thing for any man to establish the fact that Freemasonry has directly descended from those great cults. The Secret Tradition in Freemasonry, Vol. II, Waite. The Book of Acts, Expositor’s Bible. Mystery Religions and the New Testament, Sheldon. Roman Society from Nero to Marcus Aurelius, Sir Samuel Dill. The Works of Franz Cumont. Le Culte de Mithra, Gasquet. Plutarch. Life of Pompey, Plutarch. Corpus Inscriptionum Latinarum. Mythrasliturgie, Dielitch. History of France, Vol. V, Vol. VI, Vol. VII, Duruy. Roman Society in the Last Century of the Western Empire, Sir Samuel Dill. See bibliography in Hasting’s Encyclopedia of Religion and Ethics, Vol. VIII, p. 752. Ars Quatuor Coronatorum, Vol. III, p. 109; Vol. IV, p. 32; Vol. XIII, p. 90. The History of Freemasonry, Vol. I, Gould. Mackey’s Encyclopedia-(Revised Edition): Allah, 46, Babylon, 89. Egyptian Mysteries, 232-233. Egyptian Priests, Initiations of the, 234. Gnostics, 300-301. Legend, 433. Manichaeans, 462. 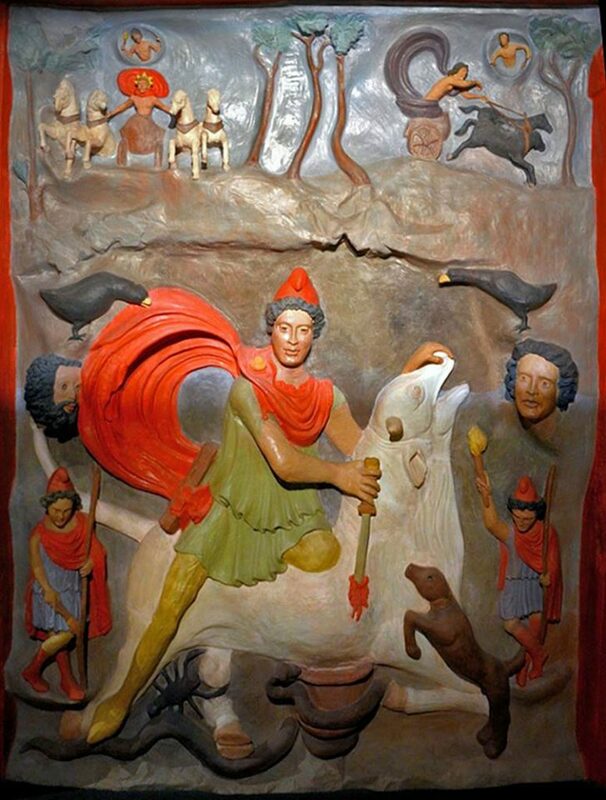 Mithras, Mysteries of, 485-487. Mohammed, 488. Mysteries, Ancient, 497-500. Mystery, 500. Myth, 501. Myth, Historical, 501. Mythical History, 501. Mythology, 501. Myth, Philosophical, 501. Ormuzd, 539. Persia, 558 Pike, Albert, 563. Roman Colleges of Artificers, 630-634. Vol. 1, 1915. – Symbolism, The Hiramic Legend, and the Master’s Word, p. 285; Symbolism in Mythology, p. 296. Vol. II, 1916. – Masonry and the Mysteries, p. 19; The Mysteries of Mithra, p. 94; The Dionysiaes, p. 220; The Mithra Again, p. 254; The Ritual of Ancient Egypt, p. 285; The Dionysiaes, p. 287. Vol. III, 1917. – The Secret Key, p. 158; Mithraism, p. 252; Vol. IV, 1918. – The Ancient Mysteries, p. 223. Vol. V, 1919. – The Ancient Mysteries Again, p. 25; The Eleusinian Mysteries and Rites, pp. 143, 172; The Mystery of Masonry, p. 189; The Eleusinian Mysteries and Rites, pp. 218, 240. Vol. VI, 1920. – A Bird’s-Eye View of Masonic History, p. 236. Vol. VII, 1921. – Whence Came Freemasonry, p. 90; Books on the Mysteries of Isis, Mithras and Eleusis, p. 205. Vol. VIII, 1922. – A Mediating Theory, p. 318; Christianity and the Mystery Religions, p. 322. Thanks for the comment. We will look that up and add it to the post.